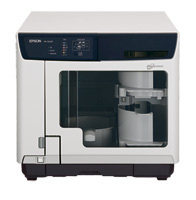 Why the Epson Discproducer PP-100AP? Incredibly, you can produce over 1,000 prints per set of 6 ink cartridges. And because it uses a separate cartridge for each colour, you only need to change the cartridges that are near empty. This page was updated Tuesday, July 20, 2010 at 2:59:53pm by Microboards Marketing Department.